The Recovery Plan for Tidal Marsh Ecosystems of Northern and Central California features five endangered species: two endangered animals, California clapper rail (Rallus longirostris obsoletus) and salt marsh harvest mouse (Reithrodontomys raviventris) and three endangered plants, Cirsium hydrophilum var. hydrophilum (Suisun thistle), Chloropyron molle ssp. molle (soft bird’s-beak), and Suaeda californica (California sea-blite). The biology of these species is at the core of the recovery plan, but the goal of this effort is the comprehensive restoration and management of tidal marsh1 ecosystems. This recovery plan is an expansion and revision of The California Clapper Rail and Salt Marsh Harvest Mouse Recovery Plan (U.S. Fish and Wildlife Service 1984). The historic distribution of the California clapper rail encompasses major tidal marshes between Humboldt Bay and Morro Bay, defining the approximate geographic scope of this recovery plan. 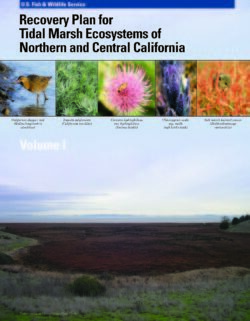 In addition to the California clapper rail and the salt marsh harvest mouse, the plan also covers three focal listed plant species that were listed as federally endangered in the 1990s and the northernmost population of an additional plant species. Two of the species, Cirsium hydrophilum var. hydrophilum and Chloropyron molle ssp. molle (this species’ former name is Cordylanthus mollis ssp. mollis which is how it appears on the List of Threatened and Endangered Species, but we use the currently accepted name here), are restricted to the northern reaches of the San Francisco Bay Estuary. The other endangered tidal marsh plant, Suaeda californica, historically occurred in both San Francisco Bay and Morro Bay but, except for three reintroductions to San Francisco Bay, is now restricted to Morro Bay. Another federally listed plant, Chloropyron maritimum ssp. maritimum (salt marsh bird’s-beak; formerly Cordylanthus maritimus ssp. maritimus), has its northern range limit in Morro Bay. Morro Bay was omitted from the Salt Marsh Bird’s-beak Recovery Plan (U.S. Fish and Wildlife Service 1985a) because the taxonomic interpretation at the time classified this population in another subspecies that is not federally listed. Current taxonomic interpretation considers the Morro Bay population as Chloropyron maritimum ssp. maritimum. It is included in this recovery plan due to its co-location with Suaeda californica in Morro Bay. Though recovery strategies and actions are provided for the Morro Bay population of C. maritimum ssp. maritimum, recovery criteria are not, therefore, the species should not be considered covered by the recovery portion of the document. In addition, this recovery plan addresses 11 species or subspecies of concern. These include the salt marsh wandering shrew (Sorex vagrans halicoetes), Suisun shrew (Sorex ornatus sinuosus), San Pablo vole (Microtus californicus sanpabloensis), California black rail (Laterallus jamaicensis coturniculus), three song sparrow subspecies of the San Francisco Bay Estuary (Alameda song sparrow [Melospiza melodia ssp. pusillula], Suisun song sparrow [M.m. maxillaris] and San Pablo song sparrow [M.m. samuelis]), saltmarsh common yellowthroat (Geothlypis trichas sinuosa), old man tiger beetle (Cicindela senilis senilis), Lathryrus jepsonii ssp. jepsonii (delta tule pea), and Spartina foliosa (Pacific cordgrass). These species occur in a variety of tidal marsh habitats where they are limited by the requirements of moisture, salinity, topography, soil types, and climatic conditions. Adjacent uplands and ecotone areas are also crucial habitats for many of these species. Primary threats to all the listed species include historical and current habitat loss and fragmentation due to urban development, agriculture, and diking related to duck hunting; altered hydrology and salinity; non-native invasive species; inadequate regulatory mechanisms; disturbance; contamination; risk of extinction due to small population size; and the most central threat, sea level rise due to climate change. 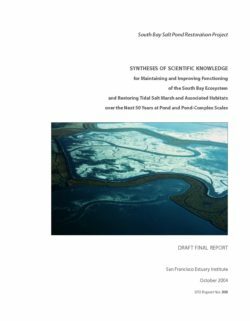 This synthesis focuses on the form and function of South Bay landscapes to address the following two issues – maintaining and improving functioning of the South Bay Ecosystem; and restoring tidal salt marsh and associated habitats over the next 50 years at pond and pond-complex levels. This synthesis is organized into five parts: (I) Definition of the South Bay Ecosystem; (II) Historical Conditions; (III) Landscape Modifications; (IV) Modern Conditions; and (V) Restoration Tools, Targets, and Related Questions. Specific topics posed by the Science Team Lead are addressed in each part of the synthesis.